Guillermo Scott Herren, best known for his work as Prefuse 73 and Savath y Savalas, has formed a new project with drummer/producer Zach Hill, drummer for avant-noise group Hella and producer for Marnie Stern, Cex and others. The group is called, oddly, Diamond Watch Wrists. Their album, Ice Capped At Both Ends, drops May 4 on Warp Records. Guided by two artists with slightly disparate backgrounds, Ice Capped At Both Ends blends the wintry (or summery, depending on how you hear it) folktronica of Savath y Savalas with the propulsive drumming and indie-rock sensibility of Hill’s work. 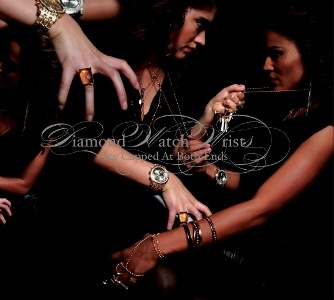 Meanwhile the vocals, contributed by Tyondai Braxton, are very sardonic and surrealist, hence…uh… Diamond Watch Wrists. The project is the second installment in a trilogy of albums Herren plans to release this year. The forthcoming album dropping on WARP are a definitive collection between Zach Hill, Myself and Tyondai Braxton pulling together songs chosen to see the light of day. This entry was posted in News and tagged Diamond Watch Wrists, Scott Herren, Warp, Zach Hill. Bookmark the permalink.